These are important questions for this New Year. Did you know that you literally have 3-5 seconds to impress a visitor? Statistics show us that today’s consumer demands we move forward with what was labeled as “responsive web design.” And from experience, having this technological versatility brings increased engagement, conversion and ultimately higher ROI. Your hard work and investment can in fact be distilled into a single glance which determines whether or not a visitor will consider your website worth their time. 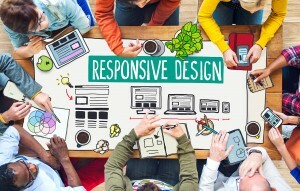 So What Does Responsive Design Even Mean? I’m sure you’ve heard this saying before, “Don’t sweat the small stuff.” Well, as it pertains to responsive website design, this is far from the truth. From overall load time to the size of your images, what matters is that mobile users deserve the same browsing experience as any other visitor. The days of having a separate mobile site are over. You can now have a responsive design where the same message, offer and experience is carried across to every type of user. Also, when laying out your content, remember that a four-column layout on a desktop screen will scale down to two and then single columns across devices. So positioning matters. Get rid of all non-essential content when considering your mobile formats. Not everything works well across mobile so make sure you have the end-user in mind. Simplify your navigation by having a custom navigation for mobile vs desktop users. Streamline the mobile navigation to provide easy access to your offers, phone number, and locations. The faster the load, the better the experience. Again, Less is more. Measureable results – that’s what you need! If you have Google Analytics, or an equivalent program, configured on your website (and I hope you do), having goals to go after month after month should be a centerpiece of your online marketing strategy. In short, knowing your audiences, their behavior and whether or not your marketing dollars are working will help you consider the investment into building a new responsive design. While responsive design is critical for 2015, let’s not forget that even font choice, colors and having the right logo have some level of impact on user experience. Responsive design also works very well for ecommerce so make sure you apply what these basic principles accordingly. Test, test and then test some more. Cross-browser test, proof all copy, test all buttons and downloads, complete all forms – you name it. Make a list and check it twice! Sites like Browserstack.com are great for live, web-based browser testing. Are you looking to dive deeper into the world of responsive website design? Learn about our all-inclusive inbound marketing system to see how an engaging online experience is only the first step!